Popular decorating idea: Drape a homemade or store bought Noah's Ark Banner across a mantle, table edge or wall. 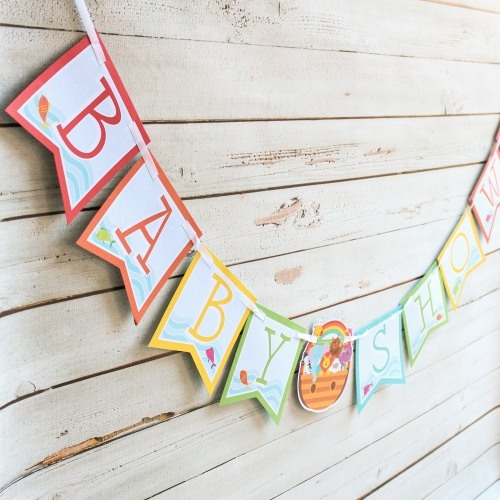 A Noahs Ark baby shower is a timeless theme full of extra-cute decorating options! 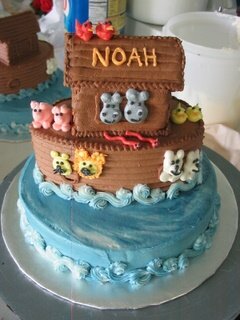 Boy have we got a bundle of adorable ideas up our sleeve for planning the cutest Noah's Ark shower around! Cake, decor, favors and more! Many mother's-to-be choose to decorate the nursery in this theme, so naturally their baby shower follows the same idea! It is also perfect for a twin baby shower since the animals went "2 by 2". 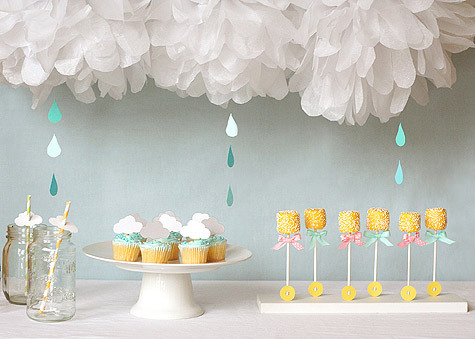 Below are some cute ideas for hosting a spectacular Noah's Ark baby shower! 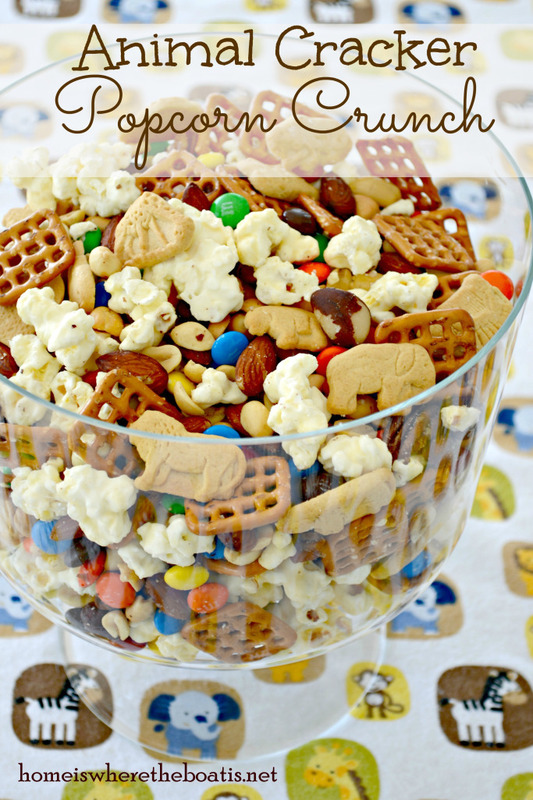 Have snacks such as Chex mix and nuts with a sign next to them saying "Please Don't Feed The Animals"
Serve mini doughnuts and stick little flags in them saying "life preservers"
Bake sugar cookies and cut into cute animal shapes with cookie cutters! You can also do the same thing with sandwiches! 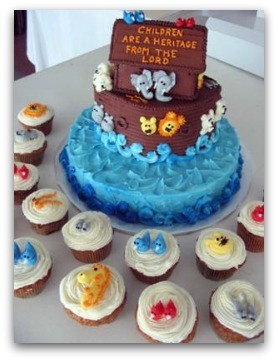 We've got some adorable 'Noahs Ark Cakes' for you to see! Elephants, Lions and Giraffes ... oh my! Be sure to scroll down to the end of the page! We designed some FREE printable boat decorations that you can print from home and use to decorate the baby shower! Attach to skewers and poke into a simple white cake, string onto ribbon and make cute garland, anything you can dream up! You won't want to miss these! I made this cake using several stacked tiers: first, a 10" round single-layer for the bottom. Then, the Ark is made out of 2 small oval layers 5x7"), and a little loaf cake. The Ark roof is two graham crackers leaning together, and iced in chocolate butter cream. The Ark house and base is also iced in chocolate butter cream, and textured with a decorating comb. The 10" layer is iced in light blue butter cream, and textured with a spatula or spoon to look like waves. I piped a C scroll border in darker blue striped with white, around the base of the 10" tier- to look like waves. 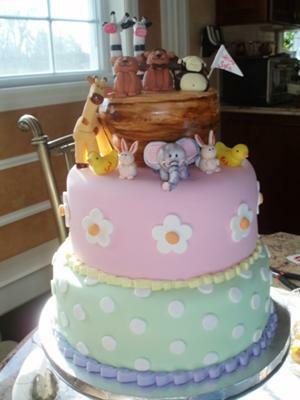 The animals are the fun of this cake and cupcakes! They are made with multi colored icings and mostly round (large and small) tips. I use large round to pipe the base or head shape, and then use the little round tip to make facial features, like nose/nostrils, mouth, ears, and smile. Using a #3 tip I made the snakes, mice, and birds. I used a star tip and small round to make the lambs. The elephants ears are with a petal tip, #104. The male lion and giraffe has a tip 2 pull out mane. The cupcakes were carrot cake iced in cream cheese and decorated with the buttercream animal heads. They were a hit at the party! I made this cake using several stacked tiers: first, a 8" round single-layer for the bottom. Then, the Ark is made out of 2 small round layers (6") carved, and a little loaf cake shortened. The Ark roof is two graham crackers leaning together, and iced in chocolate butter cream. The Ark house and base is also iced in chocolate butter cream, and textured with a decorating comb. The 8" layer is iced in light blue and white butter cream marbled together. I piped a C scroll border in blue striped with white, around the base of the 8" tier- to look like waves. The animals are the fun of this cake! They are made with multi-colored icings and mostly round (large and small) tips. I use large round to pipe the base or head shape, and then use the little round tip to make facial features, like nose/nostrils, mouth, ears, and smile. Using a #3 tip I made the snakes and birds. The birds' beaks are small leaf tip #352. I used a round tip to make the pink pigs and grey hippos and polar bears. The male lion has a tip 2 pull out mane. Detailed Instructions and how-to-tips: Bake 1 10in, 1 8in and 1 5in. Cut and fill cakes. apply thin layer of BC and let stand in fridge to settle. Color fondant using gel colors and knead until nice and soft. Roll out fondant onto powdered sugared surface and make sure it's nice and even and large enough to cover your cake. Lay fondant on top of cake and start smoothing sides with hands and smoothing tool. Cut away extra fondant with paring knife or pizza cutter. Repeat for other tiers. Stack the 2nd tier on top of the first one by inserting wooden dowels making sure not to go out of the 8in diameter. Place some bc on top of cake before placing 8in on top of 10in and repeat with 5in. Insert long wooden dowel through all 3 cakes to insure stability. Decorate using cookie cutters and fondant. Animals are modeled out of gum paste and colored using gel colors. Serve white, Wintergreen Lifesavers in little candy dishes and labels them "life preservers. "Tie rolled up napkins with jute and add a Lifesaver to each one. You can also slip the utensils into the bundled napkin. Fill a baby bottle with Gummy Bears, tie with a cute gingham ribbon and add a favor tag! If you have more than one table - You can put 2 animals in the center of each table "two giraffe's", "two monkeys", "two lions", "two elephants", etc. Take 2 tall cylinder shaped glass vases - Make sure that one of them is a few sizes smaller than the other. Place the smaller vase inside of the large one. Fill the small vase with flowers and water. Then, fill the space in between the two vases with Goldfish crackers. Add enough so that you can no longer see the smaller vase inside. This makes such a cute presentation! For a centerpiece which also doubles as a baby gift: find a plastic boat and fill it full of baby essentials (onesies, socks, rattles, lotions, etc) and cute little animals. Download and print our FREE printable boat decorations. Use as confetti, string onto ribbon to make garland, attach to toothpicks for cute food and cupcake picks, use for name tags, favor tags or gift tags! Click on either picture to visit the page with the free printables on it! Nursery Rhyme Animals: give clues to nursery rhyme animals such as - "who followed Mary to school one day?" or "What nursery rhyme animal jumped over the moon?" or "What nursery rhyme animal lived with Old Mother Hubbard?" As guests arrive, have them take some animal crackers out of a bowl (tell them to have a seat, but not to eat their crackers) When everyone has been seated, go around the room and have each guest tell an interesting fact about themselves. One fact per animal cracker they took. This is a great icebreaker game!